The Bora One 50 disc brake is the perfect answer for cyclists wanting to leave their mark on routes with high-speed stretches. 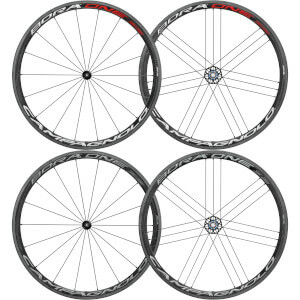 Its 24.2 mm width maintains high weight and steering standards, offering excellent aerodynamics for users who team it with a 25 mm tubular and extremely high levels of comfort and safety when braking for those who prefer to use 28 mm tubulars. 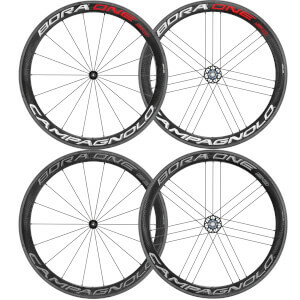 The result is a pair of carbon racing bike wheels that delivers incredible performance in terms of aerodynamics, stiffness, steering and reactivity, while maintaining the famous smoothness of the Bora. The Bora One 50 disc brake was the first wheel tested by the pro riders on the Campagnolo teams together with the groupsets and it favorably impressed its testers Erviti, Greipel and Berlato. The Bora One 50 DB wheel is entirely hand-assembled by a specialised Campagnolo® technician and is checked in every tiny detail with electronic instrumentation. This ensures maximum performance and reliability for all Campagnolo® wheels.